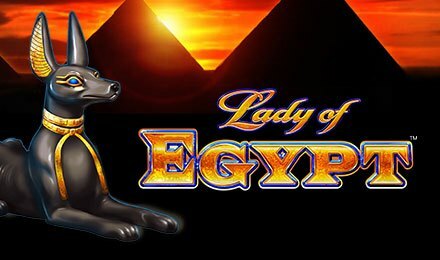 Lady of Egypt slot from Scientific Games is a 10 reel and 9 payline game themed on the last ruler and most iconic woman of Ancient Egypt! The slot game features a unique horizontal reel layout that comes packed with great bonus rounds and features. Available at Wicked Jackpots Casino - play this game on your mobile, desktop or tablet and enjoy the wins generated! On the reels, make winning combinations with symbols like; Cleopatra, Anubis, Bastet, Eagles, Snakes, Crook & Flail, Ankh, A, K, Q, and J. The Bet/Line Field is the tab where you need to toggle the + or – symbols to adjust your stakes. This slot game also comes with the Autoplay option, which gives you the chance to set your game to auto, and let it play handsfree! Amount of Paylines Selection: Paylines are fixed. Coin Values: Set your bets from £0.35 to £175.00. The wild symbol of Lady of Egypt Slot is the Golden WILD, and replaces all other symbols bar the golden scarab symbol. It appears only on reels 2, 4, 6 and 8. This slot game is loaded with three jackpots, which are triggered at random! Now, try your luck to trigger one of the jackpots; Mini, Major or Grand. The Golden Eagle is the scatter of the game, which triggers the Free Spins Feature when three or more of them land anywhere in view. 3, 4 or 5 symbols award 8 free spins, 12 free spins + 10x or 16 free spins + 25x correspondingly. Speed Active Reels shift by two reels to the right to award expanded pays. Every payline comes built with Speed Spin multipliers of 5x and can be triggered at any time. You are subject to 5x your stake while the symbols shift to reel 10 for you to trigger a winning line or expanded pay win. Grab the chance to seize 10x or 25x if a prize lands in the middle of the 10th reel.